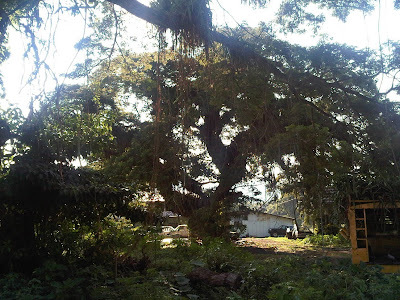 Kevin Kidney: Original Swiss Family Robinson Tree FOUND!!! Okay now. Everyone take a deep breath. This is really big news. The tree of our dreams has been found! The wonderful treehouse built by the shipwrecked Robinsons in the 1960 movie fired up my childhood imagination like nothing else. 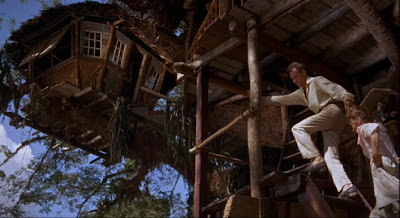 (Ironically, as I got older, the treehouse continued to have special significance for me!) I'd drop everything in a heartbeat if I could build a bamboo home in the branches of an enormous tree, with a waterwheel turning in a little creek, and the excitement of the jungle all about. So, it is with great pleasure that I introduce to you Mr. Lennox Straker Jr., a resident of Tobago (where the film was shot) and, miraculously, a reader of my blog! After I posted about the Swiss Family Robinson's tree a few months ago, Mr. Straker decided to take it upon himself to seek out and photograph the giant living Samaan tree used in the movie fifty years ago. And he did it! "Kevin, I stumbled upon your post of March this year "Some Really Big Roots" which mentioned the original Swiss Family Robinson Treehouse from the movie of 1960. 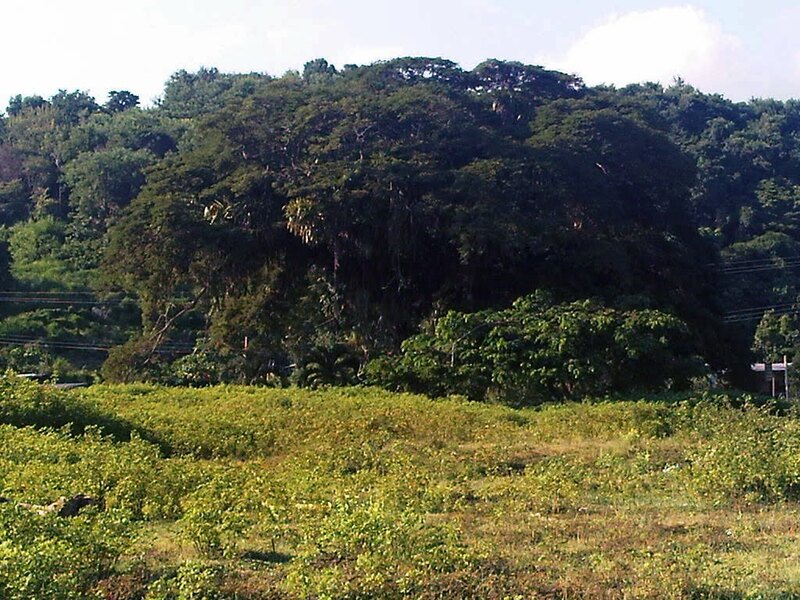 I live on the island of Tobago in the Caribbean and did research on the tree and actually found it still very much alive in Goldsborough! "The tree has fallen into obscurity; only a few of the older people knew of its significance. As a matter of fact, not many people know of the film Swiss Family Robinson much less that it was filmed here in Tobago. Acting on info I found online about it being in Goldsborough I went up there and saw two possible suspects. They were both close to the road at the end of what was once a playing field. I identified this tree only after realising the stream that ran in front of it (also visible in the movie) and then an old gentleman came around and I asked him where is the tree located and he said "you are looking at it." "The tree is on private lands and there are old appliances at its trunk and some of the branches have been cut, there is no physical evidence of anything in the trees but I did not go up close to see if possibly there were carvings or subtle evidence of the movie. "I do intend to go again though because, like you, this fascinates me. I think a plaque or something should be placed on this tree." John Mills and Dorothy McGuire reenact a scene from"Vertigo". 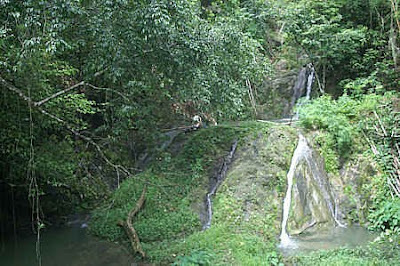 The two-tiered Craig Hall Waterfall is just off of the side of a road, and, apparently, easy to find. The first tier falls into a large pool, which then spills over the rock face into the river below. Sounds like heaven! 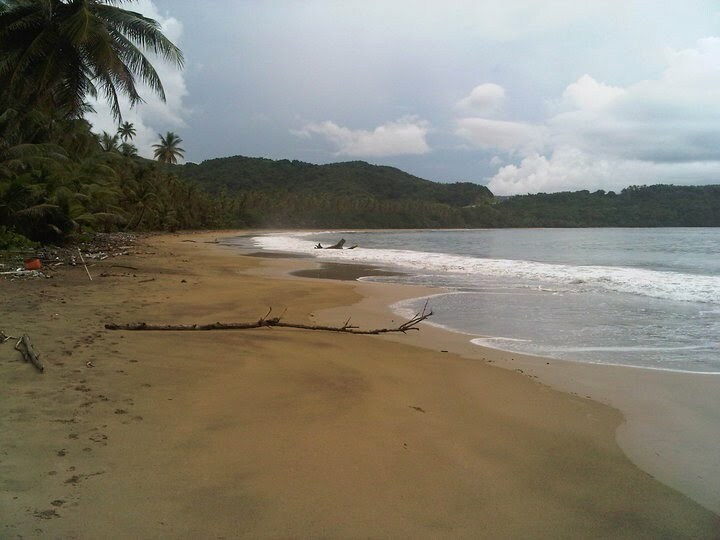 Tobago still has stretches of pristine beach, and this may be the spot where the Robinson's wash ashore and, later, discover the Chinese pirates. Wow! A big heartfelt THANKS to Lennox Straker, for his excellent detective work, and for sharing his discoveries with us. I'll be getting my passport in order and heading to Tobago ASAP! Wow, what a beautiful place. I would imagine that, after 50 years, any traces of the original movie sets have long since decayed. Even nails and things like that might have been "swallowed up" by the tree. Neat story though, and great detective work! I am having a total nerdgasm. Oh. My. God. Haha!! Kate, you said it! Me too. What a scoop! Coolness, coolness, coolness. I recently got to visit the Bilbo birthday party tree in New Zealand so I know how personal trees can be! There. I was sent to issue that message and now I complete my mission. SO COOL! What an excellent story. Thanks Lennox for finding the tree! I was thrilled to meet Tommy Kirk at the D23 Expo last year. When I asked him what his favorite movie memory was, he said it was SFR in Tobago. He told us it was a beautiful place and he had many happy memories of that time. 6 Degrees of Swiss Family Robinson - excellent post! What joy when the world (all too) occasionally comes through with the shining verification that the Stuff of Our Dreams IS tangible and true! A misty-eyed chorus of "My Heart Was An Island" and a high-stepping "Swisskapolka" thank you to all involved here! I still envision SFR the way I imagined it as I was reading my paperback Scholastic book club copy back in the 1960's. When I finally got rid of it it was in sections, held together by a rubber band. That one and Jungle Book. I didn't actually see the movies until I was an adult (my mom was adamant about me not attending a movie theater). But I did enjoy the movie and the attraction at Disneyland back when. Thanks for the pictures and news. I LOVE the SFRTH, and much like you, it propelled my love for Disneyland and adventure. SERIOUSLY? I would love to see that. What a find. This is more satisfying than finding the Loch Ness monster. Great story, thanks. I used to work across from the DL Tree at Sunkist and loved the Swisska polka. Never got sick of hearing it. There is that fantasy we have of living in something like that and to see the real tree makes it that much more real in a way. Question to the board at large. After studying the image of the tree in context with the cars, etc, to my eye it looks very small but still proportunate. I wonder if the rooms shown in the film were built in forced perspective and or scaled down below human size to be a backdrop? Perhaps there are set design plans of the huts that are up there? Most likely built in the field from the concept sketches. The interiors must have been shot on larger sets on stage. Fantastic! It'll be a trip of a lifetime when u and Jody go. Ever since my father told me when I was a young boy that the movie was NOT filmed using the Swiss Family Treehouse IN Disneyland I've wanted to visit this far off land to see the real thing. How fun would it be to do a road trip looking for a bunch of iconic landmark sites where movies were filmed. It is amazing how seemingly little things from movies become embedded in our memories and become "feel good" memories. Thanks for sharing this!! What a great find!! I love this movie. Now I have to go watch it :) The movie also always made me want a pet zebra, which would be a terrible idea! Holy Smokes! What a great find! Well done Mr. Lennox Straker Jr. and thanks KK for posting. You made my day. Thank you so much for pursuing this! I teach eighth grade math and for some reason the other day, mentioned this most wonderful of childhood memories to my class. What a delight to find this post! Awesome find, I'm hoping to travel out there for a fun trip and going to add this to my hikes! I was there during the filming and played for hours in the tree house. As an annual reader of Kingston's edition, I know what I'll be dreaming about for the next few days. Kevin, I was recently on Tobago and photographed and measured the tree. I would like to email you an accounting of that. Is that the same piece of driftwood on the beach? Ha! The pirates were speaking Malay. Some of the words we just gibberish. I am desperately trying to find a copy of the theme song from the "Swiss Family Robinson" movie. I am needing to turn to the experts because the search engine gods are not on my side today. I think your site mentions that it is called "My Heart was an Island" by Terry Gilkyson, and at one point in my search, I thought I had found a site that sold the sheet music. Now I am hitting dead ends everywhere I turn. Any help in this area?? Do you know of anywhere it's possible to get a poster/print of the treehouse concept art you included in this post? The movie and that Disneyland tree house fired my youth like nothing else. I am in architectural design because of the Disneyland tree....50+ years of tree house dreams. 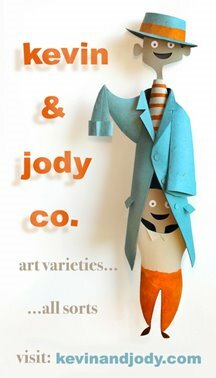 Thanks so much for your web page, it brings back wonderful warm memories. I am completely blown away. This iconic movie fuels my wanderlust and sense of adventure. Borneo and the south seas islands beckon. VERY cool! was looking for the location of the "Anaheim" tree that inspired the Tree House tree at Disneyland when I came upon your page. Great work! i'm visiting tobago now (just reached this morning) and i'm going to hunt this tree down!!!! 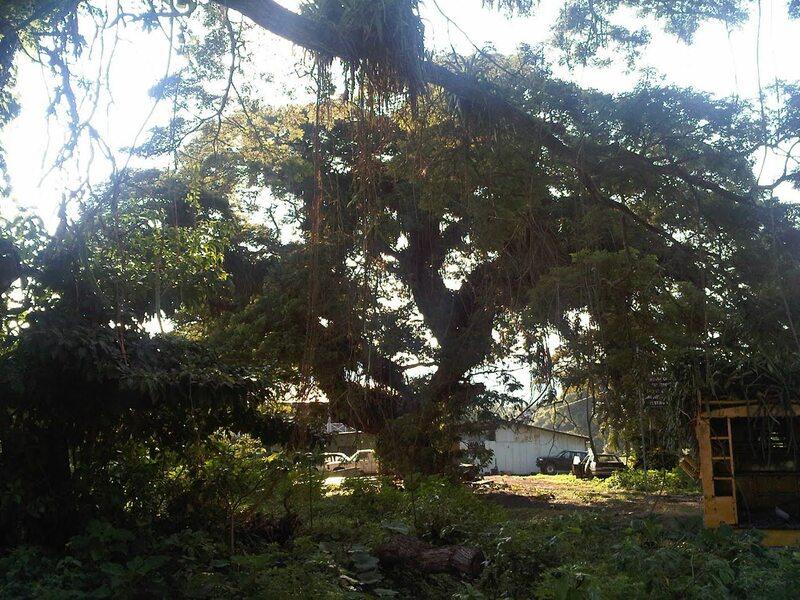 i found your blog a few months ago when i was searching for things to do and see in trinidad & tobago and grenada..... i don't care if i don't do anything else in tobago.... i HAVE to find this tree!!!! i'm a huge fan of the movie... so this is special to me!!!! thanks so much for sharing this info!!!! 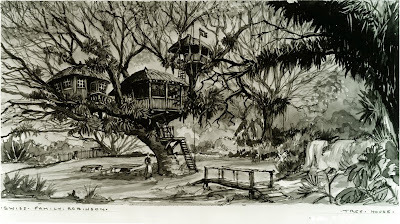 I heard on the Swiss family Robinson dvd commentary that the original tree house was wash away by a tsunami years ago and there is nothing left. The tree was set near the beach. I don't think this could be the tree. 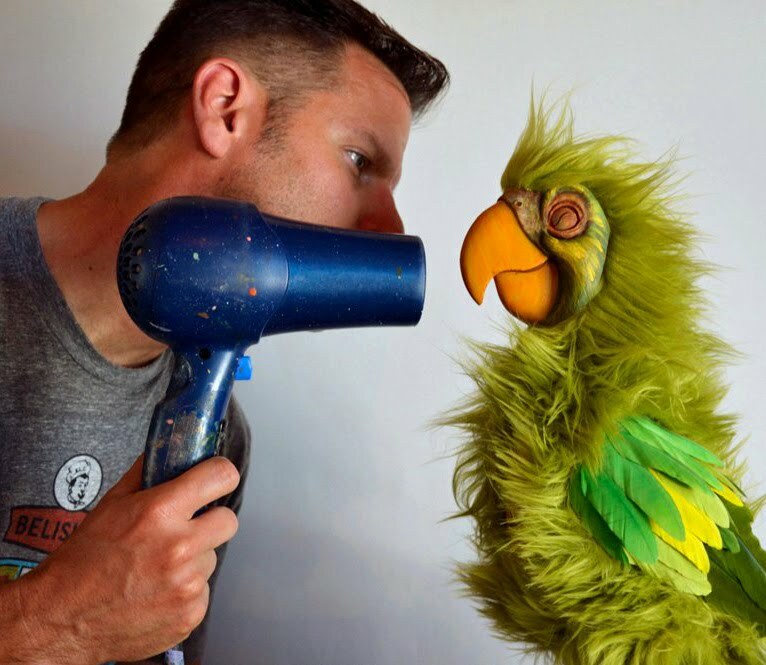 I loved this movie growing up and so naturally I am interested about this post. Don't think this is it! Shannon, it may be incredible, but this really is the tree in the film. The location has since been verified by the Disney Company, as well. The shooting locations for the Robinson's island home were actually filmed all over Tobago in different places. 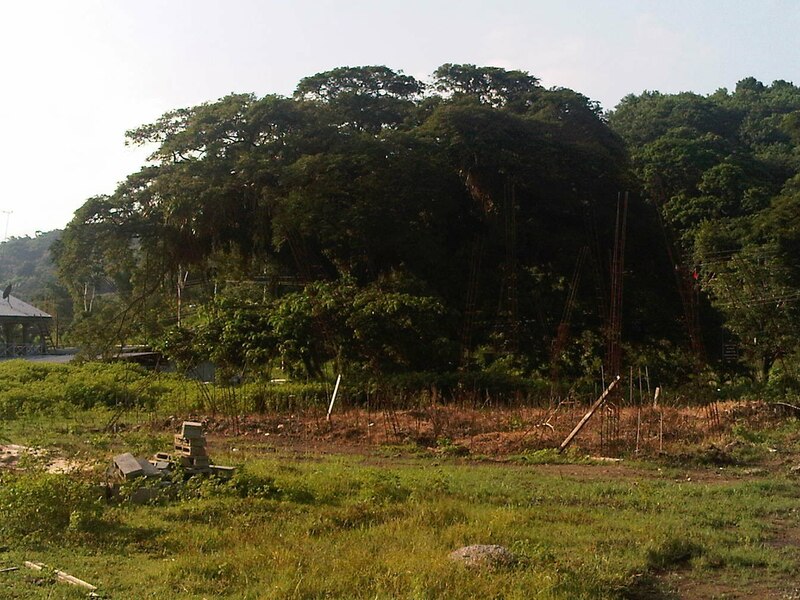 The tree house was constructed in the 200-foot spread of this living Samaan tree. Art director John Howell famously spotted it through a gap in a fence at the corner of a cricket field just outside the town of Goldsborough. 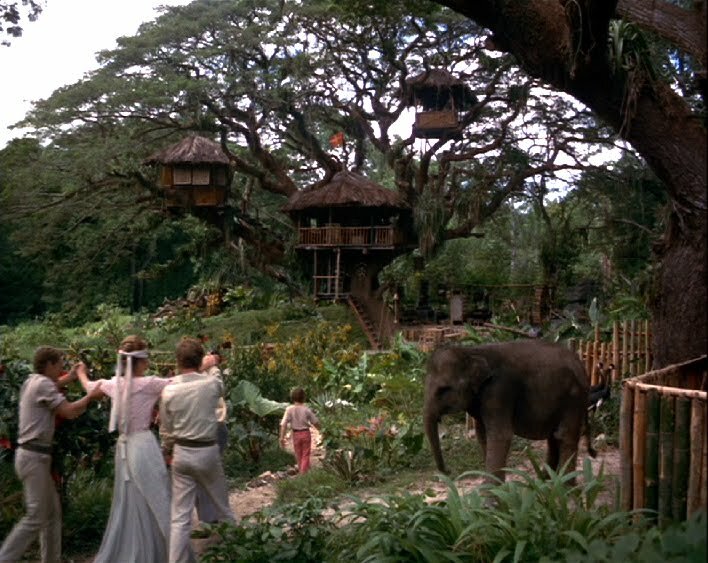 I have seen Swiss Family Robinson 100 times. It's one of my all-time favorite movies. On a whim I decided to google to see if anything remained of the original set, and stumbled across this post. I may have a new mission in life to visit Tobago. I love the internet. I was in Tobago this week, April 2017 and passed by a few of the sites. Sadly the beaches are really dirty or overbuilt and the Swiss Family Robinson Tree is in worse shape than ever. I first saw this tree in 1991 and the area around it was more lush, now it's on a lot used as a waste dump and two of the lower limbs have been burnt or cut off. Still a majestic tree. @diplomaticon, I would LOVE to see the photos! This tree and land deserves and needs to be saved. Tobago/Disney history. I remember growing up and watching Swiss Family Robinson on VHS and I now own it on DVD. I am 18 years old. I LOVE this movie. The oldest brother is James MacArthor, who is in a Bonanza episode and in another old Disney movie in which I also own. It is called Kidnapped. This movie Kidnapped is only found on the Disney Store website. I SO wish that I could visit where Swiss Family Robinson was filmed!!! It is so BEAUTIFUL there!!! Thank you so much for writing this and sharing this amazing story with us, thanks to the Author and to the Detective!!!!!!! !